Forfar Farmington head coach Damon Neish was delighted with how his side played as they extended their league winning run to six games against Stirling University. Amy Gallacher’s eighth of the season after just 108 seconds was enough to deservedly keep all three points at Station Park against the only side above them in the bottom half of the table. Despite having captain Nicola Davidson back, Farmington fielded the same side for the third week running, therefore Davidson had to be content with a place on the bench. The side were off and running after just 108 seconds, a fantastic piece of play, beginning in their own half, saw Derrian Gollan, Jade McLaren, Tori Sousa and Amy Gallacher all exchange passes before McLaren cut the ball back for Gallacher to sweep home. Gallacher could have added a second just a minute later after being set up by Sousa but she sent her effort wide. Stirling forward Nicole Pullar forced a great save from Fiona McNicoll in the 5th minute before sending a long range effort over. In the 23rd minute another passing move saw Megan Burns swing a cross in that found Gallacher then Johnstone, who laid it off for Lindsey Dunbar but her shot flew wide. Johnstone then nodded straight at Chloe Logan as Farmington pushed for a second. The side were dealt a blow in the 38th minute, Megan Burns went over her ankle and had to be replaced, with Nicola Davidson coming on in a reshuffle of the defence. 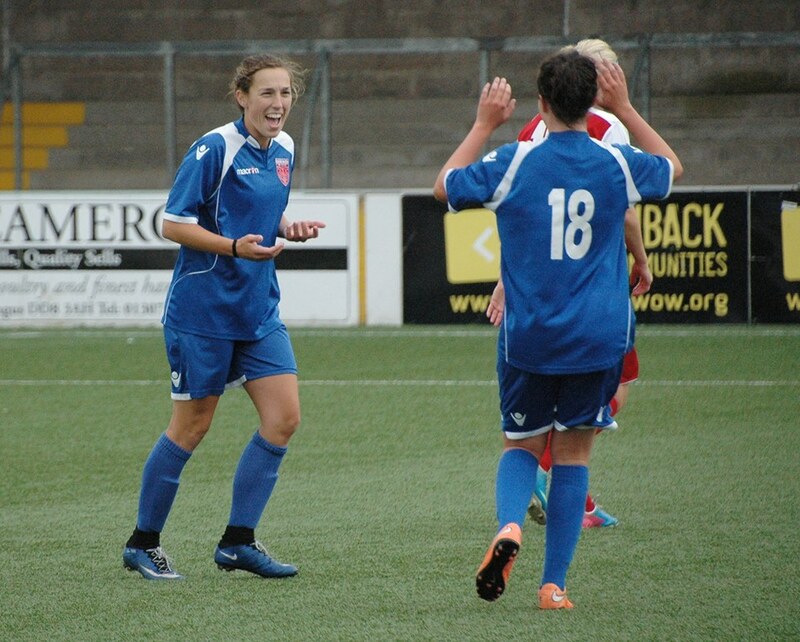 As half time approached Lisa Sutherland had two great chances to equalise but found McNicoll in good form. Forfar came out for the second half looking the better side again and had two chances in the first ten minutes, Gallacher firing wide after being set up by McLaren before the defender herself was denied by a great last ditch challenge by Rachel Donaldson. In the 58th minute Gallacher was again denied by Logan whilst Dunbar nodded wide from the resulting Napier corner. On the hour mark Sousa had a fantastic chance to net her third of the season as she advanced into the box but the Stirling keeper again denied the home side. In the 67th minute Donaldson saw her goalbound effort touched over the bar by an alert McNicoll and from the resulting corner Sutherland had her shot cleared by Dunbar. Dunbar then headed wide at the back post from a Sophie Milligan cross before McLaren did the same with a Davidson free kick with fifteen minutes left. Stirling tried desperately to break through a tough Forfar defence but the side, who have conceded just two goals in their last six league games refused to give in and held on for all three points. The win takes Forfar to 22 points, with the nearest side below on eighteen after Hearts’ win over Hutchison Vale. Forfar Farmington: Fiona McNicoll, Jade McLaren, Megan Burns (Nicola Davidson 38), Sophie Milligan (Alex Russell 77), Gemma Collier, Tori Sousa, Amy Gallacher, Lindsey Dunbar, Keira Johnstone (Kayleigh Noble 89), Derrian Gollan, Holly Napier. Stirling University: Chloe Logan, Rebecca Blair (Beth McKay 58), Christie Kerr, Emma Lyons, Rebecca Robertson, Jill Paterson, Lisa Sutherland, Rachel Donaldson, Jennifer Godfrey, Nicole Pullar, Ashley McDonald. Subs not used: Lauren Eadie, Kerry Kennedy, Susanne McLennan. Forfar Farmington continued their run as the Scottish Women’s Premier League in form side with a 3-1 win over Hamilton Academical on Sunday. An early opener from Keira Johnstone alongside an Amy Gallacher double means the side have now won five in a row in the league which is better form than joint leaders Glasgow City and Hibernian, scoring more and conceding less than the pair. ”I believe it’s just down to our own self belief. The first half of the season wasn’t the best for us and it wasn’t because of other teams, it was actually down to ourselves and the mistakes we were making. We are more than capable of going unbeaten this second half of the season and we have started that run incredibly well. Farmington made a dream start just eight minutes in, Amy Gallacher gliding through Hamilton’s midfield before poking the ball wide to Tori Sousa; she cut the ball back for Keira Johnstone, who fired home inside the box. Johnstone went close again in the 16th minute, receiving a ball from Megan Burns but she could only fire wide of the mark. Five minutes later Sousa and Gallacher combined to put a cross into the area, Gollan nudged the ball out to Lindsey Dunbar, whose shot rattled the crossbar. Forfar did double their advantage seven minutes before the break, a poor kick out by the Hamilton keeper was collected by Sousa and she sprayed the ball to the unmarked Gallacher; the attacker slipping the ball under the advancing keeper. They did go close to adding another before half time, Jade McLaren heading onto the roof of the net while Napier saw her long range effort fly past the post. In the 54th minute Johnstone went close again, this time volleying a Sousa cross wide. Napier sent a free kick inches over five minutes later while Accies’ Karen Baillie fired wide after getting in behind the Forfar defence. Hamilton’s McGregor pulled off a great point blank save from McLaren in the 68th minute but was unable to stop Gallacher four minutes later. A neat Napier corner was sent in the direction of Gallacher and she hit an unstoppable effort from 25 yards into the ceiling of the net for her seventh of the season. The keeper was forced into action twice in the final moments, first denying Sousa of a deserved goal before a fantastic fingertip save from a Noble volley outside the box. The win coupled with other results puts Farmington four points ahead of the relegation spots with six games remaining. They now hope to continue the winning streak next Sunday against the only team above them in the bottom six, Stirling University at Station Park, kick off at 2pm. Forfar Farmington: Fiona McNicoll, Jade McLaren, Megan Burns, Sophie Milligan, Gemma Collier, Tori Sousa, Amy Gallacher, Lindsey Dunbar, Keira Johnstone (Alex Russell 81), Derrian Gollan (Kayleigh Noble 62), Holly Napier. Forfar Farmington moved out of the relegation places with an excellent 2-0 against Hearts in Dalkeith on Sunday. A second goal in three games from Tori Sousa after just 93 seconds along with a Jade McLaren long range effort early on in the second half sealed the points for a side who have now won four league games in a row, scoring fifteen while just conceding one. With captain Nicola Davidson and keeper Fiona McNicoll unavailable, McLaren came in after missing out last week due to concussion while former Aberdeen keeper Lauren Sangster played as a trialist. Chelsey Lownie also dropped out to be replaced by joint top scorer Keira Johnstone. Farmington made a dream start just 93 seconds into the game when a free kick from the halfway line by Gemma Collier took a deflection inside the box and then found its way to Tori Sousa, who swept the ball home. The side went hunting for a second to really stamp their authority on the game and went close again a minute later when Johnstone fired wide. Captain for the day Holly Napier saw two efforts saved by Autumn Farrell within the opening ten minutes. Hearts had their first chance soon after when Kirsty McLaughlin hit the side netting and then saw a low attempt held by Sangster. In the 25th minute McLaren rose to meet a Napier corner but could only watch as Farrell caught the header while Sousa fired inches past the post. Napier went closest to adding to the early goal ten minutes from the break, her free kick from just inside the Hearts half hitting the crossbar with Lindsey Dunbar slicing the rebound wide. Sousa blasted over from another Napier set piece but it was Hearts who had the last chance of the half in added time; Vicki Farquhar seeing a header hit the post from a McLaughlin corner. Forfar looked to have a similar start in the second half, just a minute in Sousa played a fantastic pass across the pitch that found Johnstone but her shot hit the wrong side of the net before Amy Gallacher fired straight at the keeper. The lead was doubled in the 53rd minute, Napier giving the ball to McLaren, who from 25 yards out sent a low effort towards goal. The shot looked to have been covered by Farrell but at the final second it took a slight bobble and it was fumbled into the net for McLaren’s fourth of the season. The game dulled down after this, with Farmington looking the more likely to add to their advantage, although Hearts were attacking well too, Patricia McLaughlin in particular a threat. With fifteen minutes left, Gallacher blasted over after being set up by a Kayleigh Noble and Sousa combination. Gallacher played a great ball in for Gollan in the 81st minute but Farrell was sharp enough to come out and gather in from the toes of Gollan. Forfar saw the game out and were ecstatic to get three points which moves them above Hearts into eighth place and out of the relegation places. The side are in phenomenal form and will hope to continue that this Sunday when they face Hamilton Accies at Station Park, with a later kick off time of 4pm. Forfar Farmington: Lauren Sangster, Jade McLaren, Megan Burns, Sophie Milligan, Gemma Collier, Tori Sousa, Amy Gallacher, Lindsey Dunbar, Keira Johnstone (Kayleigh Noble 74), Derrian Gollan (Alex Russell 85), Holly Napier. Forfar Farmington were knocked out of the Scottish Cup on Sunday after a 5-0 defeat at home to Hibernian in the third round. 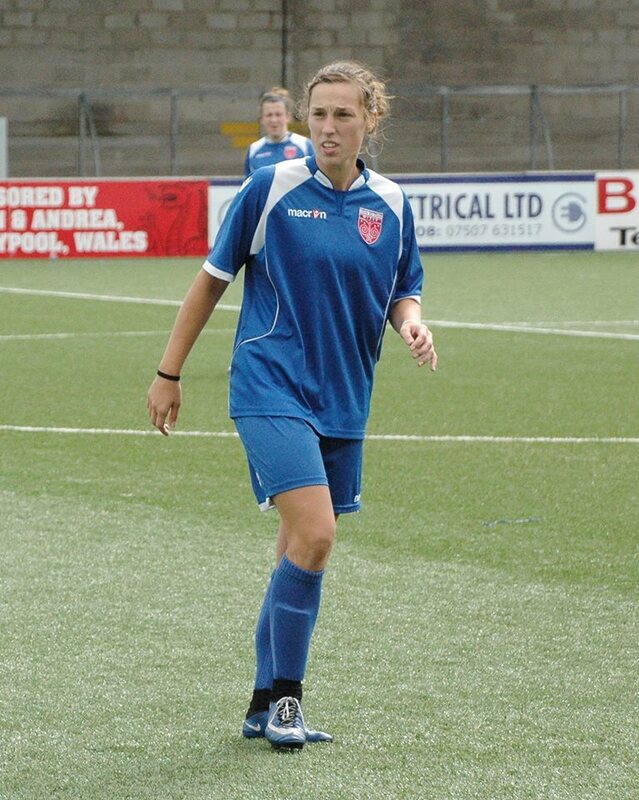 Despite the result, midfielder Joanna Collier was delighted to be back on a football pitch after two years away from the game. Collier came on as a sub for the remaining twenty minutes while her younger sister Gemma played the whole game. After last week’s comprehensive victory, Damon Neishwas forced into three changes, Jade McLaren had concussion so was replaced by Sophie Milligan; Keira Johnstone and Kayleigh Noble also dropped to the bench with knocks with Derrian Gollan and Chelsey Lownie taking their place. In what was a drab game, there were little chances in the first half, despite Hibs going into the second half four goals ahead. The first goal came in the eighth minute after a shot was deflected wide, Hibs’ Chloe Arthur swung a corner in that was met by Siobhan Hunter but her header was saved; Abi Harrison sweeping home the loose ball. It was two for the visitors after 21 minutes, Cailin Michie capitalised on a poor pass by a Forfar midfielder and she fired home from just inside the box after a drive forward. Harrison went close in the 29th minute with a long range effort that flew over but did manage to find the net again six minutes later. Almost identical to the first goal, Arthur’s corner found Hunter; her header was saved and Harrison knocked the ball into the net. Another Arthur corner led to Hibs’ fourth five minutes from half time, this time Lia Tweedie nodding the ball home. The second half was even quieter than the first, although Forfar had the first effort on goal, vice captain Holly Napier saw her ferocious thirty yard striker held by Jenna Fife. Farmington then hit the side netting soon after; great play between Amy Gallacher, Lindsey Dunbar and Derrian Gollan ended in Gallacher’s ball in the box being met by Derrian Gollan but she could only hit the wrong side of the net. A minute later Hibs made it five, Arthur firing home after breaching the home defence. The game was dull and tedious after that, with both sides struggling to break through each other’s defence. Hibs did go close through sub Heather Richards in the dying stages but the shot was saved. Not long before this Richards had fired over from inside the six yard box. Forfar’s last attack saw Gallacher play a good ball through for Tori Sousa but Fife was alert to gather it before Sousa could latch onto it. The side now move onwards and upwards to next week’s league game away to Hearts. Sub not used: Keira Johnstone. Hibernian: Jenna Fife, Claire Williamson (Emma Brownlie 74), Zoe Johnstone, Siobhan Hunter, Lia Tweedie (Heather Richards 65), Lisa Robertson, Cailin Michie, Joelle Murray, Chelsea Cornet, Abi Harrison (Liz Arnot 56), Chloe Arthur. Sub not used: Kirsty Smith. Forfar Farmington’s new midfielder Tori Sousa was delighted to score on her debut as she believes the first goal is the hardest. 22 year old Sousa signed for the club last week from Central Connecticut State University and was placed in the starting eleven for the 7-0 win over Inverness City. Tori, who is from Nashua in New Hampshire, explained it was because of club chairman Colin Brown that she came across to Forfar, the Farmington part of the club’s name taken from the town in Connecticut. At CCSU, Sousa won the North East Conference in her senior year as well as being named as the NEC Player of the Year for 2014, which is no easy feat. Tori also played for University of Massachusetts before joining the Blue Devils in 2013 and has been named in All-NEC Tournament and All-Atlantic 10 Rookie squads as well as being an All-NEC 1st team selection as a junior at Central. Sousa is looking forward to doing more in Scotland as well as playing and her teammates have already offered to show her different places in the country. Forfar Farmington defeated Inverness City 7-0 on Sunday and head coach Damon Neish was impressed with how professional his side were. A double from Holly Napier along with goals from Keira Johnstone, Amy Gallacher, Lindsey Dunbar, Jade McLaren and debutant Tori Sousa sealed the win for a dominant Farmington. The side could have had a lot more than seven with Napier hitting the post, Sousa the bar and Inverness keeper Kim Jappy in fine form. The head coach believes that with six different scorers, it shows Forfar can threaten from anywhere on the park and was delighted with the debut of Sousa. Forfar were quick to start showing their intentions, with the ball rarely getting past the half way line from the Inverness half in the first five minutes. Holly Napier fired over early on but went one better in the sixth minute; Lindsey Dunbar sent a great through ball for Amy Gallacher to race on to and her cut back was bundled home by the midfielder for her third of the season. Dunbar had a thirty yard effort tipped over as Forfar hunted for a quick second goal. In the 16th minute Tori Sousa almost announced her arrival to Scottish football in style, weaving her way past two defenders but her shot was blocked by the onrushing Kim Jappy. Gallacher and Sousa went close again as the barrage on the Inverness goal continued. The visitors had their first shot on goal 22 minutes into the match, Natalie Bodiam firing straight at Fiona McNicoll. Farmington went close again several times throughout the first half, with Jade McLaren, Gemma Collier, Napier, Keira Johnstone and Gallacher all having efforts held by Jappy. They did eventually net the second on the stroke of half time, good work from Megan Burns ended in Kayleigh Noble swinging a cross into the box for Johnstone to rise and send a looping header over Jappy for her fourth goal in four games. Just twenty seconds into the second half Napier saw a shot hit the post with the follow up from Johnstone saved but it was three for them a minute later. Napier’s pass found Gallacher on the edge of the box and she fired home. The home side had at least ten efforts on goal in the fifteen minutes after half time, Gallacher, Napier, Dunbar and Johnstone all involved but it was the debutant Sousa who netted the fourth in the 54th minute. Gallacher won the ball after poor defending before setting Sousa up and she was more than happy to slot home for her first goal in Forfar colours. Farmington kept the pressure up but found Jappy still in good form, denying Dunbar yet again. In the 67th minute Gallacher had a great chance to make it five but she fired over from close range. It was five a few minutes later, a Napier corner found Dunbar who rifled home through a pack of players. Four minutes after the goal McLaren got in on the act, stabbing home a Johnstone cross. McLaren turned provider in the 80th minute, laying the ball off for Napier as she netted her second of the game to make it seven nil. In the dying stages of the game Sousa and Gallacher exchanged passes and the American saw her effort beat Jappy but rattle off the crossbar. Napier almost had her hat trick in injury time, her shot from outside the box flying inches over the bar. With this victory, the side move onto thirteen points, nine of those coming in the last three games and they close the gap on Hearts to two points following the Edinburgh side’s loss to Hamilton. The side have a break from league action next week when they entertain Hibernian in the Scottish Cup, kick off for that game is 2pm with £4 admission for adults while under 16’s go free. Inverness City: Kim Jappy; Julia Scott (Ananda Bruce 45), Megan McCarthy, Lorraine Cadden, Claire Masterton; Rachael Gillies; Natalie Bodiam, Sheena Nicol, Katrina Buckle, Suzie Adam; Alex Andrews. First half goals from Derek Young and Danny Denholm helped Forfar Athletic progress into the League Cup Second Round at the expense of Queen’s Park. Young opened the scoring after sixteen minutes following a good passing move by the Loons before Forfar were awarded a penalty in the 29th minute. Martyn Fotheringham’s spot kick was saved well by Willie Muir but Denholm was quick to bundle home the rebound. There were three changes from last week’s win against Montrose; Martyn Fotheringham, Bryan Hodge, Chris Templeman coming in for Michael Travis, Gavin Malin and the unavailable Craig Smith. Chances were almost nonexistent before the opening goal in the sixteenth minute. Danny Denholm played the ball to Gavin Swankie, who in turn gave it to Templeman, the big striker weaved his way into the box and Fotheringham back heeled the ball towards Derek Young who lashed the ball past Willie Muir from just outside the penalty area. The second goal came just before the half hour mark when Young was fouled by Bryan Wharton in the box. The referee awarded a penalty and Fotheringham stepped up to take it but could only watch as he saw the effort saved by Muir, luckily Denholm was on hand to bundle the rebound home. Forfar were playing some good football, with Hodge amongst others impressing in midfield but were struggling to break through a tough Queen’s defence. The Spiders had their first chance of the game four minutes before half time when Joe Bradley nodded a Sean Burns cross wide. The second half began slowly and the first opportunity didn’t come until the 58th minute, Bradley and Paul Woods couldn’t control the ball as it bounced about the box and it was cleared by the Forfar defence. Three minutes later John Carter sent a header from another Burns cross wide. Swankie and Fotheringham went close with impressive efforts within two minutes of each other; the latter going closest with a 45 yard effort whistling past the post. Woods had another shot saved while at the other end Hodge saw his chance pushed wide after a deflection off a defender with twenty minutes left. Home sub Billy Mortimer sent a thirty yard shot over the bar as time started running out for them to get back into the tie. Swankie had a shot saved on the line after rounding Muir, this chance Forfar’s final one of the game. With six minutes left Queen’s looked to have a great chance but winger Woods sliced his shot wide. Forfar held on for a deserved win to progress into the second round where they could face the likes of Hearts, Dundee or Hibernian. Queen’s Park: Willie Muir, Conor McVey, Sean Burns (Scott Gibson 67), Bryan Wharton, Anthony Quinn (Billy Mortimer 57), Craig McLeish (Jamie McKernon 46), Paul Woods, Vinnie Berry, John Carter, Joe Bradley, David Galt.